'Bohemian Rhapsody' delivers the greatest hits to tell a mediocre story about a legendary band, and it does them little justice. It may surprise you to know that Michael Jackson’s Thriller is no longer the highest selling album of all time in America. That title now belongs to The Eagles, but it’s not one of their studio albums at the top of the list, it’s Their Greatest Hits. A greatest hits package of hits provides instant gratification. Our culture demands that great musical acts get boxed-up and defined this way rather than listening to their albums to discover why they became worthy of a ‘best of’ in the first place. The cheat sheet is more popular than doing your homework. Music biopics work in the same way in approaching their subject, but often, these films face an impossible task because a band or singer can be hard to define. 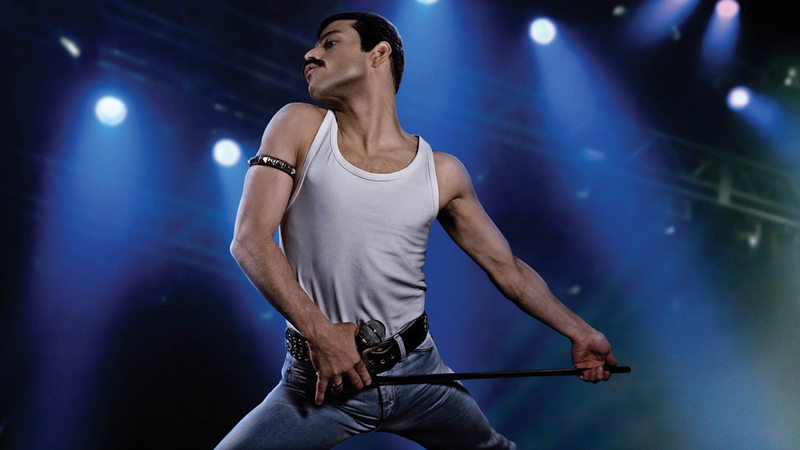 Bohemian Rhapsody is that kind of film — because there is no other musical act like Queen. 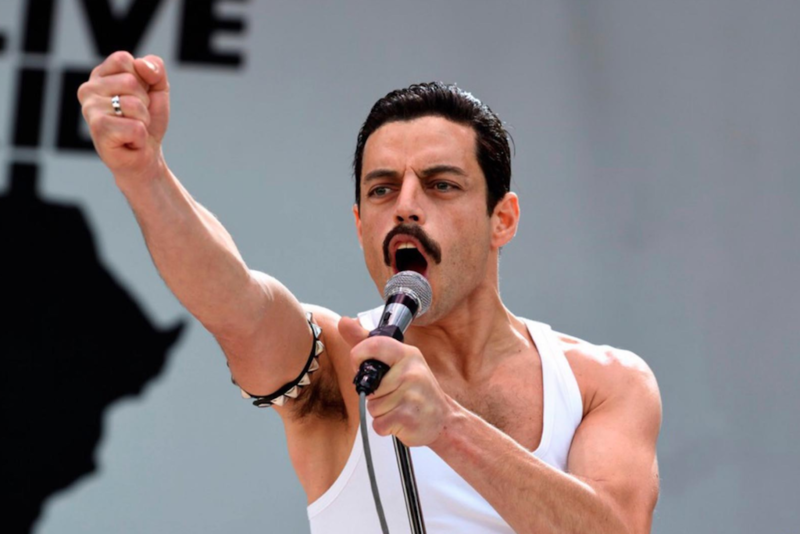 Live Aid, as depicted in ‘Bohemian Rhapsody’. Set in the 1970s (or at a Halloween party in 2018; it’s hard to tell with so many shabby wigs) Bohemian Rhapsody tells the story of how Queen formed and became one of the biggest bands on the planet, in spite of disapproving record company people, managers, parents, and sometimes themselves. The film blasts through the band’s history like a speed read of their Wikipedia page. Bookended by their iconic performance at Live Aid in 1985, the film blasts through the band’s history like a speed read of their Wikipedia page — good luck trying to figure out which albums they’re making at any particular time, because the timing is all over the place. The film also posits the question, ‘just what is Queen?’ To answer, it takes the approach of the Fast and the Furious franchise: ‘Queen is family’. Freddie Mercury (Rami Malek), Brian May (Gwilym Lee), Roger Taylor (Ben Hardy) and John Deacon (Joseph Mazzello) thrive as a band because they’re misfits who work perfectly together. The band trust Mercury’s rock opera vision but aren’t afraid to squabble about it — and the music benefits from this conflict, except for the fact that you get zero sense of the band’s musical foundations, or why exactly they don’t fit in with the music zeitgeist of the time. Mercury arrives in Bohemian Rhapsody as a caricature, teasing the band that he’s a songwriter while flapping sheets of lyrics in their faces and unleashing his astonishing voice. The film has an annoying self-awareness about the band’s trajectory — there’s absolutely no sense of these four guys discovering their talent, or even why they want to make music in the first place. The band’s evolution to prog-rock giants is glossed over by montaging their mad scientist behaviour in the studio. There’s a smugness to each of these scenes because the film works with the knowledge of Queen’s success, and that destroys the thrill of witnessing the creation of these legendary songs. The most infuriating moment is when Mike Myers — looking like a badly decorated cake melting in the sun — cameos as the record executive who doesn’t get the song ‘Bohemian Rhapsody’. You’ve seen this scene in countless music biopics, and Bohemian Rhapsody’s turns one of Queen’s greatest songs into a clichéd moment. Did we learn nothing from Walk Hard: The Dewey Cox Story? In that same naysayer scene, there’s actually a glimmer of the film that could have been when the band’s lawyer/manager (the always great Tom Hollander) states that it’s best if the court of public opinion decide the fate of Queen and ‘Bohemian Rhapsody’. There’s absolutely no sense of these four guys discovering their talent, or even why they want to make music in the first place. The British rockers had a history of defying the advice of record industry people and dodging bad reviews from critics, but like most experimental, prog rock/ jam bands (think Rush, Phish, Jethro Tull, Yes, Tool), Queen found a passionate audience of people who loved their sound. But Bohemian Rhapsody never interrogates the allure of Queen, and instead gets wrapped up in the politics of Mercury’s sexuality. It then tries to contexualise their musical output through his AIDS diagnosis, manipulating each song to enhance the tragedy. Mercury was such a dynamic performer that it makes sense for his story to take centre stage, like so much of Queen’s iconography. Even the film’s titles are framed on Mercury’s back. But Bohemian Rhapsody never links Mercury’s personal life with his musical one, and there’s no indication of how he uses music as a form of self-expression. The great singer essentially becomes an enigma within his own story. Rami Malek as Freddie Mercury in ‘Bohemian Rhapsody’. Considering Queen’s immense back catalogue, and their disregard of the boundaries of genre with each song, maybe Bohemian Rhapsody, or any film about Queen, can never truly capture their excellence. Queen were dominant at a time where albums were vital, because you couldn’t just skip around between your favourite tracks on a vinyl record easily. The band’s experimental nature created anticipation, what are these rock geniuses going to do next? The more folks didn’t get it the more passionate Queen fans became in their defence. Maybe Bohemian Rhapsody, or any film about Queen, can never truly capture their excellence. For all its flaws, Bohemian Rhapsody is a reminder of the wonderful gift of Queen’s music, and how it found its place among their legions of fans. The final Live Aid sequence manages to capture this link between Queen and 72,000 people at Wembley Stadium; one big happy family of misfits. The mystery of why we’re constantly drawn back to Queen’s music is a big part of their popularity. Queen defy everything we’ve been told to expect about rock music; they’re theatrical, melodic and operatic, but still driven by classic rock riffs and guitar solo bravado. There’s a clarity to their sound that doesn’t rely heavily on distortion or psychedelic detours into wild experimental territory. Even their “disco” phase, which relied on synths, trumpets and slick bass lines (listen to Hot Space), still maintained Queen’s vision. They’re one of the great bands because they challenged categorisation, and they did it without caring what people would think. Unfortunately, Bohemian Rhapsody can only deliver the greatest hits to tell a mediocre story about a legendary band, and it does them little justice.